The Kalkhoff Entice 5.B Tour is boasts high spec levels in Kalkhoff’s new 2019 Entice range. Power comes via Bosch’s new and fully integrated 500Wh PowerTube. With groundbreaking designs built in Germany, the Entice range is simply awesome. They represent Kalkhoff’s determination to build the very best in luxury electric bikes using the latest technology. It’s fully integrated, large 500Wh PowerTube is Bosch’s new technology. It’s easily removed from the bike and can be charged in the home or in situ. As a result result, the lines are sleek and very classy. Powered by Bosch’s high torque Performance motor, this bike means business. Powered by a whopping 500Wh battery means the Entice 5.B Tour provides huge range! Long, leisurely rides come as standard! Furthermore, this e-bike has superb hill-climbing ability too. Thanks to a Shimano Deore 10-speed derailleur, the Entice will easily climb and cruise over any terrain. Everything about the Entice 5.B Tour is designed for ease and luxury. The Purion LCD mounted neatly on the left of the handlebar provides all necessary rider info and is easy to see and use. It also has a handy walk function, so no more pushing the bike under your own steam if you do have to dismount. 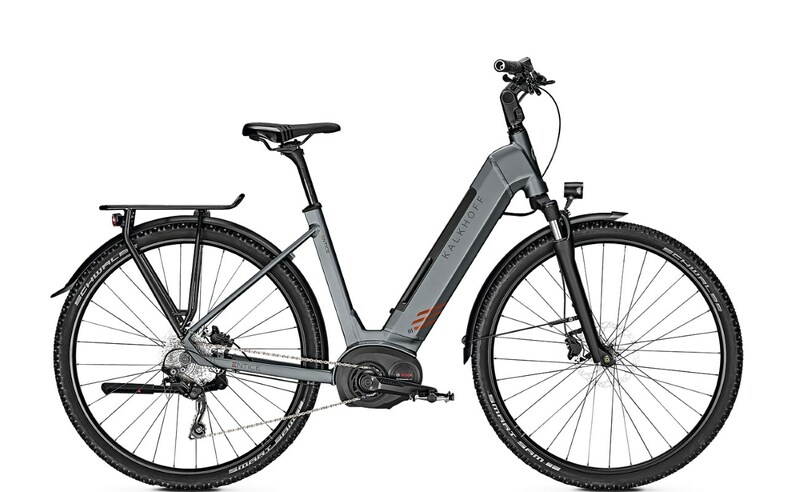 Further enhancements to the Entice 5.B Tour include top of the range LCD lighting, both front and rear as well as a rear carrier, and full mudguards. In addition, Shimano hydraulic disc brakes are responsive and effective for great stopping power. If you’re looking for a long range, comfortable touring bike based on Bosch with precision engineering, the very latest technology and fantastic looks, then the Entice 5.B Tour is worthy of consideration. Also available in trapezium and crossbar frames in a variety of sizes and colour options.